The Integrated Strategy process is the consideration of the enterprise in all it’s contexts. It’s outputs should be actionable, powerful recommendations. It’s a creative process that takes inputs from disparate sources; it requires considerable donkey work for research, occasional expert analysis, and bouts of incisive mental acuity, to formulate hypotheses and come to conclusions and recommendations. So that these recommendations get implemented, it then requires exquisite communication skills to convey, to an often cynical audience, that they are not just another person’s opinion, but that they have been formed in a rigourous, reasoned and verifiable fashion and will yield improvements. But what takes up the time is the considerable donkey work required for research. And that’s the wrong focus. 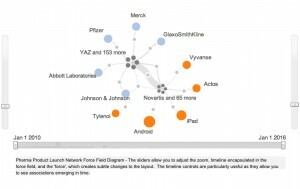 This Hack helps you research and analyze publicly available intelligence. April 2012. More about our ratings. The research activity is important – as is the categorisation and organisation of it’s findings. It’s an interative process: You start with a question, and the results inform the re-framing of the question. The higher the cost of doing the research, the lower the inclination to return to it, the fewer iterations, the lower the quality of the output. That’s where Recorded Future comes in: It’s a web-based service that is intended to “unlock the predictive power of the web”. Fully realised, it could dramatically reduce the cost of research for all manner of strategic analysis. 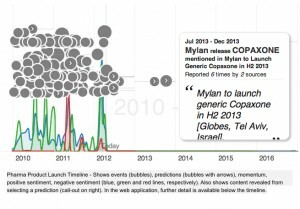 From the linguistic analysis, Recorded Future also computes “momentum” which is the amount of coverage related to a search term, positive and negative sentiment, and intriguingly, predictions of future events. This analysis is then presented to you through a number of views. The main view is the timeline, which shows the events, and momentum and sentiment lines. You can explore the content on the timeline, to investigate clusters, trends, peaks in sentiment…whatever catches your eye. You can also navigate back to the original content. 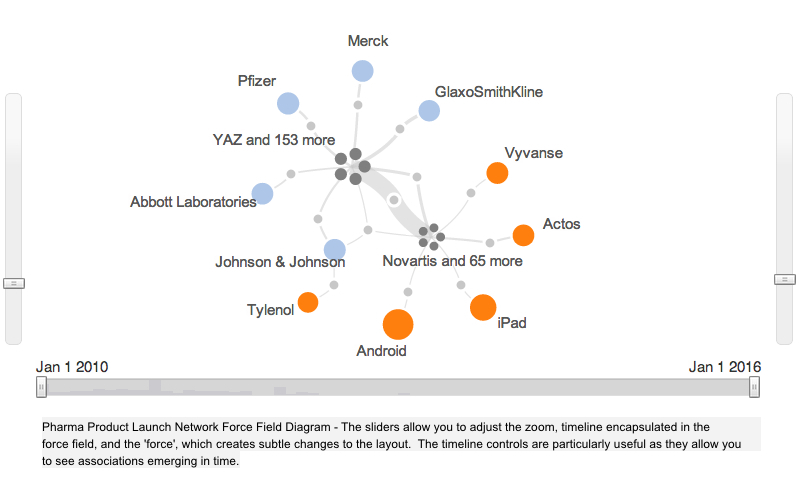 Other views include a profile of the content sources, a force field network diagram of the entities (below), and you can even plot the events on google maps to see their geographic context. The controls on the views allow you to explore their content; this is important, because it’s the starting point for your hypothesis testing. 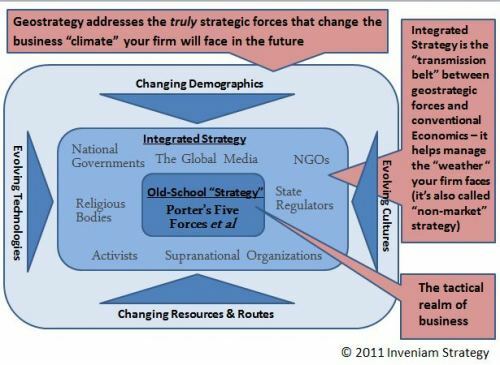 For a full integrated strategy, there’s still an enormous amount of information to take-in. There’s a lot of hype surrounding Recorded Future, due to early investments by Google Ventures and In-Q-Tel, an independent not-for-profit investment fund founded and backed by the United State’s Central Intelligence Agency, and breathless articles by the likes of Wired, all spurred-on by the company’s own efforts. They have blogs on geopolitics and financial market forecasting. Both blogs offer evidence that there is predictive information in content that can be found in the open, if you know how to look, and the latter showcasing the intriguing possibility that reliable excess returns can be made by incorporating their signals into trading strategies. The company offers access to their signals through an API, which would support incorporation into automated trading systems, or alternative user interfaces. There’s a 14 day free trial period, with no up-front commitment, so let’s dive in! The first thing to get used to is, although you need to input a search term, this isn’t a conventional search tool: your search term needs to be structured – you need to be thinking in terms of entities, events and timeframes. The interface takes you through the search term construction process nicely, then press the ‘go’ button, and within seconds you’re presented with the results. Now the fun starts. Using the Recorded Future service is a learned, and learnable, skill. Initially, I tried to search out information on Dell Services (the professional services division of the company), and found nothing. I don’t know why, presumably I was using the tool as a noobie. Later on, after using the service sporadically over the course of a day to write this article, I could start to generate results that were meaningful to me. You gain insights by exploring the results pages, and that takes a little work. The UI is a little cumbersome – I craved the ability to zoom-in and around parts of the timeline, rather than having to re-define the search term, and finding a link to read the original content was harder than it should be. On the whole, this is good value added work. Exploring the results really gets your brain cranking and you’ll be building useful insights in short order. It’s very easy to get blasé about the content and results that are delivered. Imagine the amount of work you would otherwise have to have done to collect it and put it into an explorable format! The cost of a paid subscription to Recorded Future is $149/mo, which is a small fraction of a day for a researcher, so if the quality of the research is at parity, it’ll pay for itself in a flash. And there’s every possibility this interactive service will improve the quality of both the research and the insights you get. In my opinion, Recorded Future doesn’t do any meaningful prediction itself; it’s an expert’s tool that can really support your own grey matter, and minimize the donkey work!